When your house becomes saturated with floodwater, you often imagine that everything in your home will be soaked, and that’s the end of it. But there’s more to that particular damage—so much more! Floodwater, depending on the source (whether from a violent storm or a broken sewer line), can carry dangerous contaminants and pathogens into your home. This particular invasion can have an adverse effect on the health of everyone living in your home. The most common problem affecting a structure after water damage is the growth of mold. Mold, unless properly remediated, can spread quickly and severely impact the health of people with allergies, asthma, and other respiratory problems. After massive water invasion you’ll probably want to perform some flood cleanup yourself. While there are things you can do to minimize the damage, you should not undertake the actual cleanup yourself. Remember when we mentioned those contaminants and pathogens? That’s only one of the many issues you might face. You’ll end up exposing yourself to various risks should you decide to DIY the flooding cleanup. If there is substantial flooding, the invading water can end up hiding all sorts of dangerous debris, particularly if the water is muddy. Imagine stepping on a sharp stick or rock carried in by the force of the flood. Don’t forget that you have electrical circuitry throughout your home, and some of it may be below the water line. Coming in contact with submerged outlets, electrical cords, and appliances can put you at great risk of electrical shock. However, if the water hasn’t come in contact with those electrical items, then it should be safe for you to move some furniture and other household items to a dry area so that they can dry out. While you’re waiting for the experts to handle the restoration and mold remediation, there are other simple tasks that you should be able to handle in the meantime. We mentioned moving furniture and other items to a dry area, but you should also leave doors and windows open to let fresh air flow in. If you have fans, use them. You may even be able to rent an industrial strength fan to help in removing the excess moisture. If it’s still raining, you can temporarily patch any holes or other breaches in your walls or ceiling. Obviously you’ll want to keep as much additional water out of your home as possible. The restoration specialists will make sure that your walls and ceilings look normal again, so don’t worry about making a mess. Since there will be so much dampness and moisture everywhere you shouldn’t stay inside your home for extended periods. You also shouldn’t attempt to prepare food inside a house still recovering from such extensive water damage. Time is of the essence when you’re faced with a massive invasion of water. You should contact a restoration services provider as soon as possible. Addressing flood damage immediately is the best course to take, preferably within 24 to 36 hours of the disaster occurring. 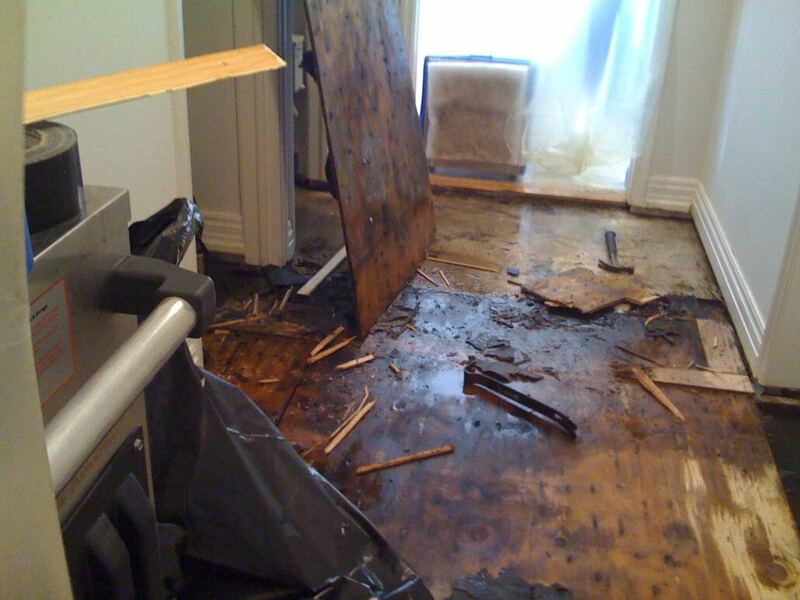 Water damage cleanup should be done by a reputable restoration company like Orange Restoration. We have technicians who are skilled and highly trained, with an array of state-of-the art equipment to handle any level of water damage. This also includes mold detection and remediation. Orange Restoration will have restoration technicians dispatched to your home immediately, and we will answer any question you have about the whole process. Upon arrival, we will thoroughly inspect your property. We will perform floodwater shutdown as well as water extraction, evaporation, dehumidification, moisture mapping, flood cleanup, disinfection, deodorization, repair, and reconstruction. Our services are 24/7, so you can be assured that our teams can be counted on to make your home whole again after flooding.